It’s been enjoyable and fulfilling to visit my garden every morning, picking peas, and watching LIFE happening all around me. In an earlier post, I mentioned that I was starting to grow food following the Food4Wealth method. You may have noticed I haven’t posted pictures of my veggie garden yet. To tell the truth, it’s because I was afraid I would fail and embarrass myself. Update: I made a video based on this post. Let me know what you think in the comments. I am a huge fan of Bokashi composting. However, there’s too much hype about Bokashi composting. These misconceptions lead to people getting disappointed or, worse, believing they’ve failed at Bokashi composting. In this post, I’d like to set some things straight about Bokashi. Below are some of the common myths and misconceptions about Bokashi composting — and the truth you should know. Myth: Bokashi composting doesn’t smell. Truth: Bokashi composting smells like fermented food. Bokashi composting is a process of fermentation and not putrefaction or rotting, which is what takes place in traditional composting. I never intended to do a Bokashi composting experiment, but that’s just what happened. When I planted three cherry tomato seedlings, somehow they each ended up with different amounts of Bokashi compost. Plant #1 was planted along the fence, facing South. It had no Bokashi compost whatsoever. I back-filled the hole with the garden soil I dug out. Plant #2 was planted right beside Plant #1. This time, though, I back-filled the hole with soil from my Bokashi soil factory. This is a mixture of Bokashi compost, potting soil, and top soil. Plant #3 was planted on my Bokashi vegetable garden beside the house, facing West. It only gets afternoon sun, which worried me. This is a raised lasagna garden. I built it above ground with the following layers: newspapers; fermented food from my Bokashi buckets (probably 4 buckets worth, most of them I kept from the previous winter); top soil; and, straw. By the way, I started these cherry tomato seedlings from organic seeds. They all started at the same time, and they were the three largest seedlings at the time that I planted them in the ground. One of the things that discouraged me about Bokashi composting initially was having to buy a “complete system” made up of at least one indoor composting bucket (but ideally two, really) and the Bokashi bran. I couldn’t bring myself to spend over a hundred dollars just so I could make compost. I found inexpensive Bokashi buckets, but ended up springing for a third. All in all, these 3 buckets (and the Bokashi bran that came with them) add up to, yes, over a hundred dollars. Well, I wish I knew then what I know now: you can make your own Bokashi buckets and Bokashi bran. 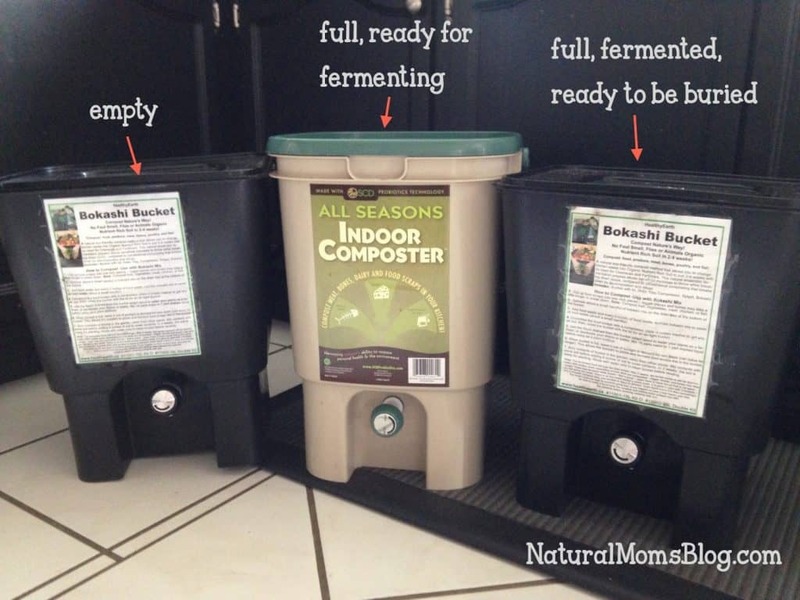 In this post, I’m going to show you three different ways to make your own Bokashi indoor composters — for free or at least close to it.